1) The R.E. Olds Transportation Museum in Lansing is a real time-travel experience as you walk among vehicles invented by Ransom E. Olds that go back as far as 1886! You will see one-of-a-kind vehicles like a 1901 curved dash, the 1906 Mama & Baby REO, a 1927 REO Flying Cloud, a 1938 REO Speedwagon Fire Truck (made even more famous by the well-known rock band of the same name) and many, many more. There’s also plenty of memorabilia to see and read, and a great gift shop with wonderful souvenirs. If you plan your tour in late July, be advised that the Car Capital Auto Show is planned for July 28 in downtown Lansing, another great way to enjoy a day. 2) In nearby East Lansing, one of the nation’s top art galleries, the Eli and Edythe Broad Art Museum is a not-to-be-missed opportunity. Summer 2018 will see multiple extraordinary art collections on exhibit, including names like Paul Cézanne, Claudia Pẽna Salinas, and David Lamelas. Just a few blocks away is another world-renown art venue, Saper Galleries, home to a breathtaking variety of art from nearby and across the globe. From glass and pottery to mobiles and wood, to paintings and drawings, once you go through the door, you won’t want to leave. Both are located in downtown East Lansing where there are plenty of places to dine, shop and relax. 3) The Sloan Museum in Flint houses an amazing array of permanent exhibit galleries like those depicting the “Sit Down Strike” and “Flint and the American Dream,” as well as changing exhibits and events. If you're up for a little stargazing while there, the nearby Longway Planetarium has daily shows, including “Skies over Michigan” that teaches a little astronomy and includes information about the recent meteor shower that put on quite a show and sprinkled lower Michigan with pieces of a real meteor. 4) The Kalamazoo Institute of Arts (KIA) is another great stop for diverse art and events. This summer’s collections include Chinese folk art from the Shaanxi Region, Passions on Paper, Global Glass and a juried show of art by Michigan residents. Also check out the various events like talks and discussions, ARTbreak on Tuesdays, or plan to join one of the public tours scheduled. 5) One of the state’s most mobile and magical events is the Hot Air Jubilee held in mid-July in Jackson. 2018 marks the 36th year for the three-day event that features massive hot air balloon launches, as well as a craft fair, carnival rides and concessions all at Ella Sharp Park, a beautiful place even without the balloons! 6) As you’re rambling around greater mid-Michigan, don’t forget to take advantage of the casinos in the area — Firekeepers Casino in Battle Creek (east of Kalamazoo) and Gun Lake Casino in Wayland (north of Kalamazoo and west of Lansing). Both casinos are open 24/7/365, have plenty of gambling options, and excellent restaurants too! If you’re on a multi-day tour, Firekeepers has an on-site hotel, and Gun Lake lists several hotels nearby. These are just a few of the many places you can go in mid-Michigan for a great group tour. 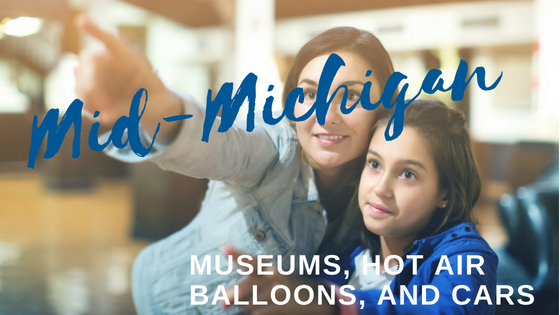 Pure Michigan has more ideas for venues all over the area, so it’s fast and easy to plan your adventure. Once you know where you want to go, call Indian Trails to take you there. We have the latest state-of-the-art motorcoaches available and the experience to get you there safely. Request a quote and get going!